One of the most practical and largest family car on the ford model line-up which can carry seven adults with ease and comfort. There are a lot of features that made Ford Galaxy popular among the taxi buyers, and families. It looks like a van at first glance and while sitting inside and driving it, it is not a van. It gives you a luxurious feel and comfort when driving it on the motorway. The boxy body shape makes it even more useful choice by allowing ample headroom on the back seats. The current Galaxy is the older cousin of the S-Max and now it is using the same platform that an S-Max is using. 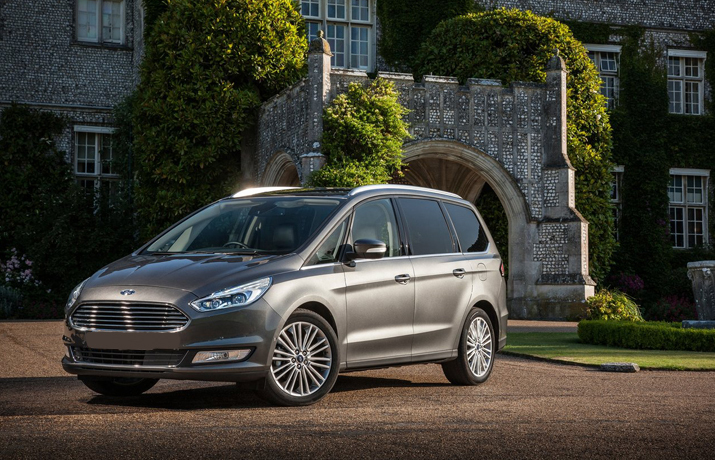 The Ford Galaxy engines lineup has been shared between the Galaxy, S-Max and Mondeo. All these models using the same engine line up. Honestly speaking, there is nothing that excellent on the front two rows of the seats but at the third row, the Galaxy offers an excellent room for the adults and it holds the great headroom and 300 litre extra luggage capacity as well. This way, the Galaxy becomes the first choice for the drivers who use it for the taxi or for a larger family. As ford is now in the position that they can offer, some world’s best engines to its vehicles where the Eco Boost, Duratorq, and Eco blue engines technologies are second to none on these engines. In the case of the Galaxy. Ford has done the same and offered a family of turbocharged 2.0 litre Eco Boost engines of 237bhp and a 1.5 litre engine of 158bhp for the galaxy petrol vehicles. Similarly, for the diesel lovers, ford has offered a 2.0 litre TDCi engine, it is the best seller in the UK and cranks 148bhp. Petrol engines are not that slow, as the 1.5 litre Eco Boost engine makes the 62 miles per hour in just 10 seconds and larger version makes the same speed in just over 8 seconds. In the entire Galaxy model range, the 1.5 litre Ford Galaxy engines have the lowest price tag and they are extremely good for the taxi drivers. It is being called the miles muncher. The 2.0 litre petrol engine is something more powerful and it is a flagship version of the Ford Galaxy petrol engines lineup. When it comes to the diesel engines, it is clear that the diesel engines would take the majority of the sales of Galaxy models in the UK, the 2.0 litre Ford Galaxy engine cranks 148bhp and it is one of the best sellers in the UK. To reach 62 miles per hour, it takes 10.2 seconds and offers a plenty of acceleration in the middle range of the rpms. A lower powered 120bhp version of the diesel engines is almost three seconds slower and makes the speed in 13 seconds. The 2.0 litre TDCi can be stretched a bit extra to 178bhp and it is worth pulling a bit harder. Especially when the vehicle is fully loaded. Most powerful diesel engines are 207bhp 2.0 litre TDCi engines. Diesel engines are most suitable options for the taxi drivers and these 2.0 litre TDCi 207bhp engines have an excellent fuel economy of 52 miles per gallon with well-controlled carbon emissions of 144g/km. in the aftermarket sales, ford Galaxy engine supply and fit are available really easily. Ford Galaxy is actually a star shining within the range of Ford family cars.